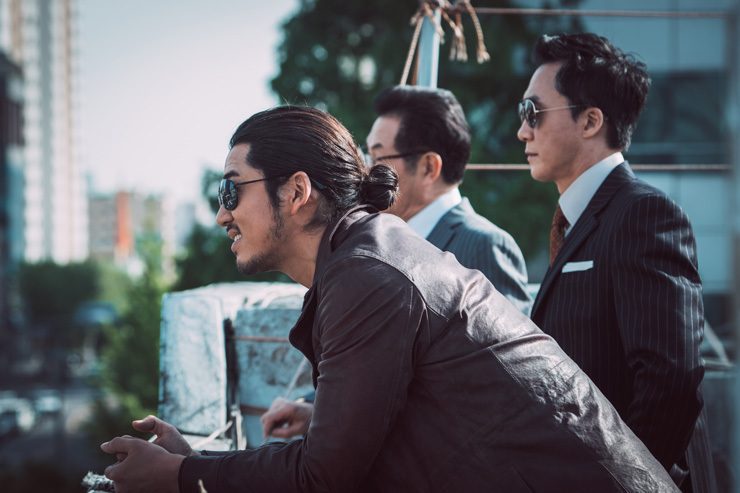 K-pop idol singer-turned-actor Yoon Kye-sang needed a boost in his 13-year acting career. He has appeared in various genres on both the big and small screen but many still remember Yoon as a member of K-pop band g.o.d, one of the legendary first generation idol groups. "The highest-grossing movie that I starred in was Lover of 6 Years, which attracted a little over million viewers," said Yoon during an interview with The Korea Times at a cafe in Samcheong-dong, last Wednesday. "I needed a strong character that could be a turning point in my acting career and it means a big change in my character. I have had enough of nerdy, gentleman and hungry lover roles." Q. How do you think you successfully portrayed the villain role for this movie? A. I made this character on my own. For previous films, staff members came up with ideas on what to wear and what hairstyles would suit my roles. For this film, I came up the idea that I will have long hair. I also kept my voice low and used the Yanbian dialect in a simple manner. I studied the dialect with a tutor for two months, taking him everywhere I went. Q. You showed great chemistry with two Yanbian gangs in the scene. How did that work? A. We had study meetings regularly. The three of us made four very different versions for each scene before we got into shooting together. We had enough time to practice and rehearse on the spot. Honestly, if actors are not close with each other, that is hard to do. We spent a lot of time together practicing, which successfully highlighted the characteristics of the Heuksapa gang realistically. Q. How engrossed in your character were you? A. At first, I suffered from flashbacks of "victims" that I killed in the scenes. Although it was acting, they stayed in my head very realistically. I tried to pull myself out of the character by spending a lot of time with my dogs. Apart from that, I think I was successful in dressing up as a gangster. The production crew told us I looked like the real Jang Chen and looked at me as if I was him. One time, I went to a convenience store in the morning to buy instant noodles dressed as Jang Chen and the clerk did not look at my face for once. I guess she did not even look at me. Q. What if this movie gives you a strong villain image and you can never escape from it? A. I will be very pleased. I had a very naive image, almost to the point that I looked stupid, and I think the villain image suits me better. I think I gave strong impressions in "Beastie Boys" and "Poongsan" but people don't remember my characters from them. It is a matter of how successful the movie becomes. Q. What kind of person is Jang Chen to you? A. He is not a human being. There should not be people like him, he is a monster. I created this character from my imagination. It was because of my passion for acting that I was able to act as a real evil character. It was never the real me from the beginning to the end.